If you closely analyse the picture you can see that the US forces did not harm his nose, mustache, teeth or even his ears. They had some sort of hatred towards Osama's eyes. The left eye is plucked out. How ever heavy damage is not done on the right eye. 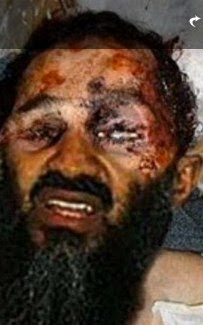 Was Osama smiling when he died? Why have they poured Tomato sauce on his forhead? Did they eat his left eye with that sauce? Do you know that Osama is the son of the Tenth wife of his father? If you are gonna give such an expression, I would say, " Hold on". After Osama was born, their parents divorced and Osama's mom married another man. Unhappy childhood could be one of the reasons for Osama turning into a terrorist. Osama went on to marry 5 women and fathered 25 children through them. What an achievement!!! He was 6 foot 4 inches tall (Almost a foot taller than Chronicwriter). Osama has a long history with aeroplanes. His father died when the pilot misjudged a landing. His brother died when he flew the aeroplane int a powercable. Some of his friends also died when they flew into the twin towers. How ever Osama had a different ending. Many consider Osama as a soft spoken and a well mannered man. If that is true, how can a man like him become the Most wanted Terrorist in the world? EMOTIONAL CONTROL is the answer. Every one of us have a Terrorist inside us. When we are rubbed in the wrong manner, we erupt. Osama also was a victim of emotional instability. His beliefs, His ideologies have physically and emotionally hurt many. Finally he paid the price for his actions. Everyone among us have an Osama inside us. We should Kill that Osama within us before that Osama Kills us. But wait a minute, Guys!!! Is he really dead or is it Obama's trick to get into office one more time? Was expecting a super humorous post but ended with a very true message... Very nice. The message in the end was inspiring and thought provoking..
so cliched man, i was expecting better. i liked your perspective about it, as always. But yeah, that image is a complete fake. It came out in 2009 also saying that osama was dead n all other rubbish. The only pics of Osama you can hope is if you marry a US Navy Seal, or if you're Julian Assange. Is it wrong if I want to fly a helicopter to Pakistan and bomb Sania Mirza?